When Napoleon was 25 he was abducted by aliens and had a chip inserted in his head. Well, he was apparently abducted, but he would have had no way of knowing that a microchip was inserted into his head. He wouldn’t even know what a microchip is. 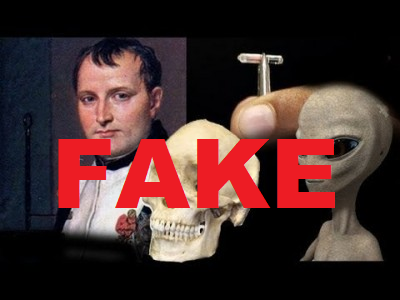 The microchip was discovered by French scientists who were conducting tests on the remains of the late French leader and military genius. To alien enthusiasts around the world this is a clear sign of extraterrestrial beings influencing world events. Never before in known recorded history have ET ever taken a person of considerable influence, it’s always been regular people. But is there any truth to this story? Unfortunately for the fans of ET, this story is as fake as the breasts of Sheyla Hershey. It never happened and the story was a complete fabrication by a tabloid newspaper, the Weekly World News, that has been published not once, but twice. Clearly it has proven to be a revenue raiser. The story that has been circulating online arose from a “news” article in Weekly World News dated 8 Apr 1997. It was run again in the Weekly World News of 11th August 2011. Now that itself isn’t enough to dispel this as a fabrication, but the Weekly World News couldn’t even keep their own story straight, and used the so called microchip image from a completely different story and from a different news source. In the first run of the Napoleon alien abduction and microchip insertion story, the scientist who made the “discovery” was Dr Antoin Lefebvre. Fourteen years later it was a different doctor, Dr. Andre Dubois, under the same circumstances that made the second discovery. This makes one wonder why Dr Lefebvre reinserted the microchip into the cranium of Napoleon, and why it was never studied further. Now for the historical microchip. The image used in the 2011 story came from a story from the BBC first used in 2004 about the US company Applied Digital’s Verichip technology. This image has been extensively used online, often in mirror image form. There are other mistakes in the articles published by the Weekly World News. Such as claims by the Dr that made the discovery that it helped Napoleon in his military strategies, and he used tactics never used before. This itself was also false, as many historical leaders deployed similar tactics and strategies as Napoleon with varying degrees of success. Did the Romans Vomit to Eat More Between Meals?